Well, I’m all set and ready. Now, it’s waiting and preparation. I’m now going to reveal some of my secrets for getting ready for the WSOP main event. First, start waking up early. The event starts at the crack of noon. For me, this means waking up 2 to 3 hours earlier than I’m used to. Over the last few weeks, I’ve been waking up earlier by 30 minutes each week. Today, I woke up at 11am with no problems. Second, stay at the Rio. This will save you at least 30 minutes traveling to the Rio in the morning. That’s 30 extra minutes of sleep. Not only that, during the 20 minute breaks, you could run to your room if you have to use the bathroom and the line is 20 minutes long. Third, pre-order room service. You can order “breakfast” the night before you go to sleep, and dinner as well. They deliver the food within 5 minutes of the specified time. Instead of trying to find a place to eat dinner, just go up to your room and eat during your 90 minutes dinner break. Fourth, play some live games with other WSOP players and make friends. This might help during the tournament, plus you may find some valuable tells. Just make sure you’re not giving away more information than you are getting. Well, since this is my first time, that’s about all I can think of for now. I’ll probably come up with more after the event. According to ”Poker Pro” magazine, the WSOP is reducing the money for the top places and increasing the money for the lower places. Of course, since I’m going to win, that’s less money for me, but if it helps the poker community, I’m all for it. But seriously, I like this idea because last year, if you made the money, basically, you just got your money back. This year, you’ll more than double your money back. Considering you are risking $10,000, and playing poker for multiple days, I think this is fair. Last night, I went to the MGM for some live poker. I’ve never seen so many bad players. In the LA casinos, you would never see players that bad at a $2 – $5 no limit table. But I guess that’s why the pros love playing in the tourist filled Vegas casinos. Actually, one of my biggest pots I won was against the best player at the table. He had a lower straight and went all-in. I figured we probably had the same hand and called. Including my money, that was about a $1,100 pot. Normally, I would stay with the monster stack and make more money, but I had to stay on my WSOP schedule so I went to bed early at 3am. 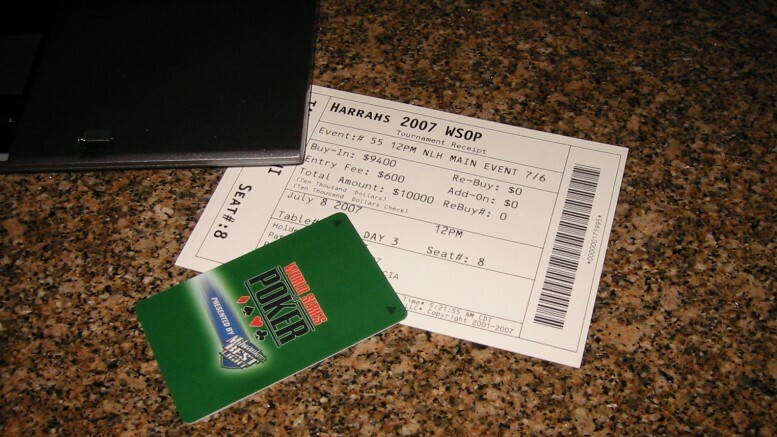 Be the first to comment on "WSOP 2007 – Preparation"